You can use PDF Watermark Remover to remove or delete watermark from PDF file easily, you can also use it to overlay a white rectangle on an image area. Some time when a PDF file is downloaded it may contain irritating watermarks. PDF Watermark Remover is a software that will allows you to delete these watermarks from your PDF pages very easily and quickly. Don't lose any time and delete watermarks, both from text and image files with PDF Watermark Remover. PDF Watermark Remover can be used easily, you can simple open a PDF file, clicking “Settings” button, select a text or a rectangle that you want to delete or overwrite, and click “Replace” button, PDF Watermark Remover will analyze the PDF pages to locate the watermarks, and then delete or replace or overlay watermarks automatically, in a few seconds you will have the PDF documents without watermarks. Allows to eliminate watermarks from both text and image PDF files, include scanned PDF files. Able to process a large amount of PDF files at the same time. Maintain the quality of your PDF documents. Text and Image Watermark Removed -- With the effective innovation of technology, both text and image watermark from PDF can be removed from the selected documents quickly. Easily Remove PDF Watermark and without disturbing the data stored in PDF. Remove Watermark from Bulk PDF -- Multiple, bulk PDF files can be selected to remove the watermark with the bulk, multiple PDF documents and that also with minimum speed and maximum perfection offered. PDF Watermark Remover is compatible with all versions of Adobe Pdf files. 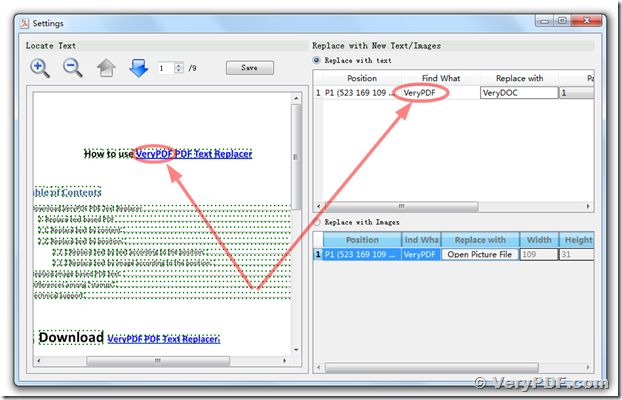 PDF Watermark Removal software deletes both texts and images watermark. Program supports all Windows operating systems. PDF Watermark Remover is graphical user interface application. PDF Watermark Remover is standalone and does not need Adobe Acrobat Reader in advance. 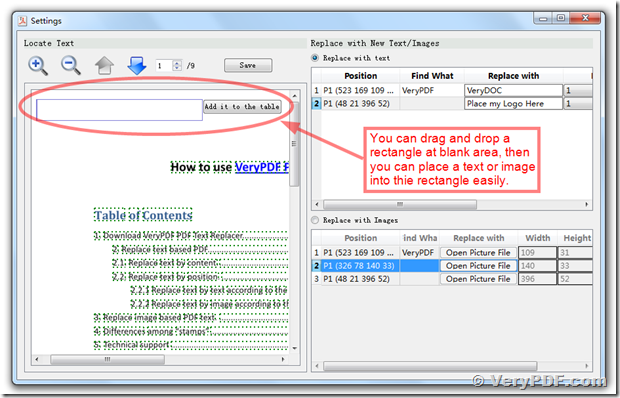 PDF Watermark Remover does not disturb the layout and structure of pdf after stamp removal. PDF Watermark Remover preserves the quality of other images and text even when watermark is removed. PDF Watermark Remover offers a quick and simple way to delete watermarks from a PDF file. You can also use PDF Watermark Remover to remove or replace any embedded images from PDF files, such as Logo, Watermark, Stamp, Signature and more. Just open the PDF file, draw a white rectangle on company logo, PDF Watermark Remover will recognize the company logo and cover a white rectangle on logo area automatically. You can Embed Your Own Watermarks into PDF pages by PDF Watermark Remover software. In addition to removing watermarks from PDF files, PDF Watermark Remover (We can also call it the PDF Logo Remover software) can help you embed your own images, logos and watermarks into PDF documents. Watermark PDF files with ease! Simply select the PDF document, select a rectangle position for logo image, load a watermark image, and choose Image Replacement option in PDF Watermark Remover, the tool will do the rest automatically. We will add a background image removal function (PDF Logo Remover function) in the next version of PDF Watermark Remover software. Do you bothered with annoying backgrounds or watermarks in a PDF file? if yes, You can clean them up easily with just a few clicks! PDF Logo Remover function offers a quick, simple way to remove embedded images from PDF files without affecting files' visual quality whatsoever. Remove annoying watermarks and clean busy backgrounds, saving toner or ink when printing multi-page documents! PDF Logo Remover module is support batch mode, allowing you to clean up multiple documents bearing the same watermark image. You can remove any type of images from PDF files, not just watermarks. With PDF Logo Remover function, you can clean up logotypes, background images, header images, footer images, watermark, signature, banner images, logo images, stamp or any other type of embedded pictures. The program scans whole pdf files and list out all embedded images. When wanting to remove photos from pdf documents, basically the program deletes the old images and place a blank image background instead. The PDF Watermark Remover tool permanently extracts photos out from pdf and makes it clear having no watermark. PDF Logo Remover function can be used easily, first of all, you need to load a PDF file, PDF Logo Remover function will list all images in this PDF file, you can select one or more images that you want to remove, then you can save to a new PDF file easily. Place a text or image at blank area. 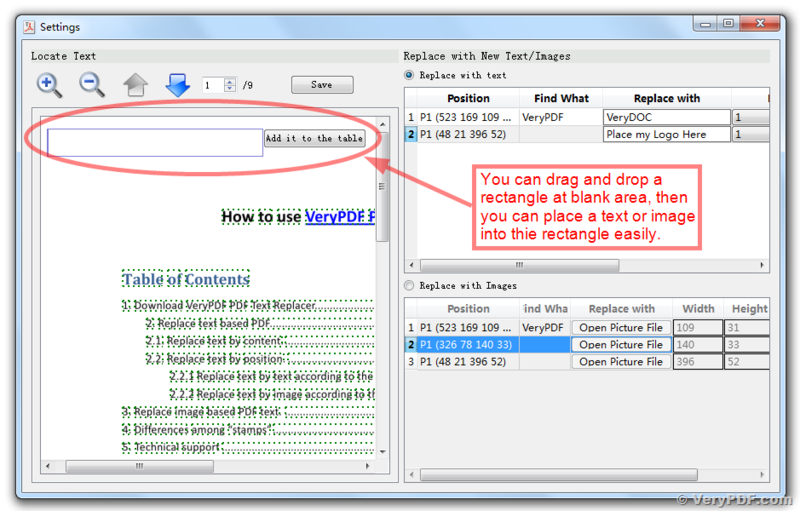 You can drag and drop a rectangle at blank area, then you can place a text or image into thie rectangle easily. How to remove PDF watermarks in batches? How to update/add logo in PDF? How to set PDF header and footer in batches? 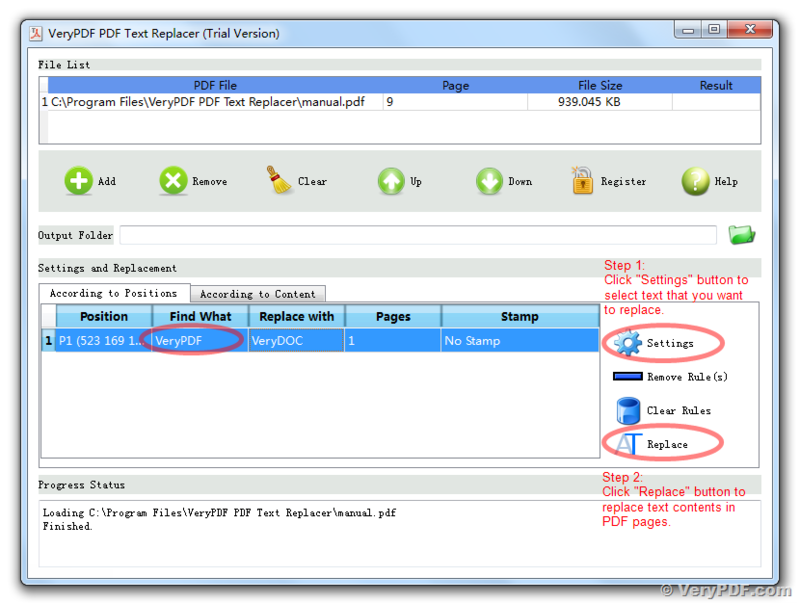 How to batch replace, delete or remove text in PDF file? 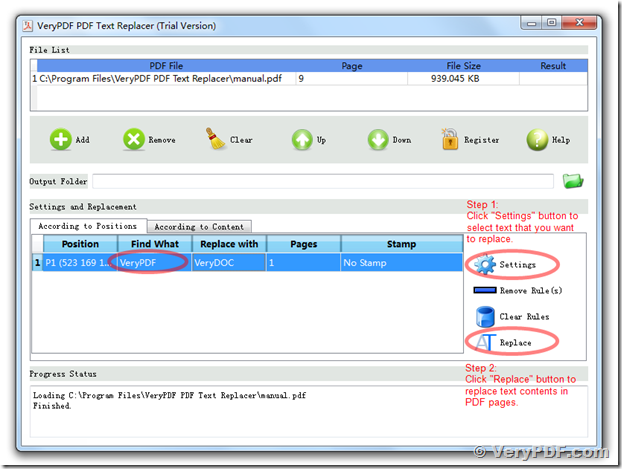 How to find and replace text in a existing PDF file with PDF Text Replacer Command Line application? 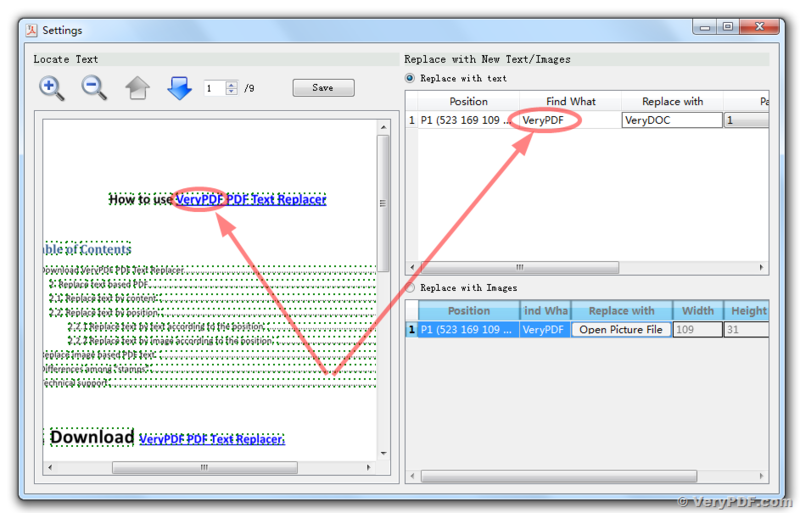 How to program a text search and replace in PDF files? This entry was posted in PDF Text Replacer and tagged pdf text, pdf watermark, replace pdf text, replace text. Bookmark the permalink.